Former VSO international volunteers share their experiences: (L-R) Sharon Dadang-Rafols, assigned in Uganda and Nigeria; Adrian Villegas, assigned in Sierra Leone; and Dr. Jaruvic Rafols, assigned in Uganda. Former volunteers of Voluntary Service Overseas (VSO) International shared their experiences as fully-funded volunteers abroad during the VSO orientation attended by students, faculty, and other members of the Silliman community March 8 at the American Studies Resource Center, Silliman University (SU) Main Library. 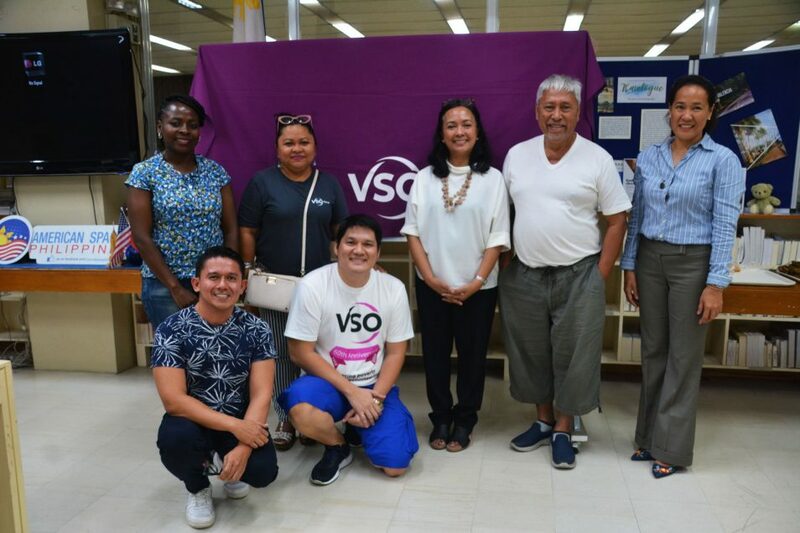 Catherine Cu, People Resourcing adviser of VSO in Asia & Pacific, said that VSO International is a U.K.-based development organization that promotes volunteering as a tool to tackle poverty and inequality. “If other organizations give technical assistance, financial [assistance], [or] infrastructure, VSO, gives through volunteering or volunteerism…We see volunteers as our drivers to systemic and sustainable change,” she said. Cu explained that VSO capacitates local organizations in developing countries by assigning international volunteers in the organizations to develop the capacity of local talents. VSO provides financial, personal, and professional support for their international volunteers. Catherine Cu, People Resourcing adviser of VSO in Asia & Pacific, leads the orientation. According to the VSO website, VSO’s financial package for its volunteers includes a local living allowance, flights to and from the place of assignment, accommodation, insurance, and more. “Our volunteers deliver service. They mentor and train individuals and then they build organizational capacities and develop institutions,” said Cu. Dr. Jaruvic Rafols, SU Guidance and Testing Division head, shared his experience as a VSO international volunteer when he was assigned as a Guidance and Counseling Specialist in Uganda from 2013 to 2014. “I did capacity-building with guidance counselors, about 49 [of them], all over Uganda…My role [was] to capacitate them how to do counseling, psychotherapy…to monitor the progress of students who experience a form of trauma…to train the counselors to do psycho-social intervention]… capacitate them to do the groundwork,” said Rafols. He added that aside from his VSO assignment, he also helped other local organizations in Uganda. “I engaged in the community, teaching the kids how to do art. I participated in art exhibits together with the locals. It was a remarkable experience for me,” he said. 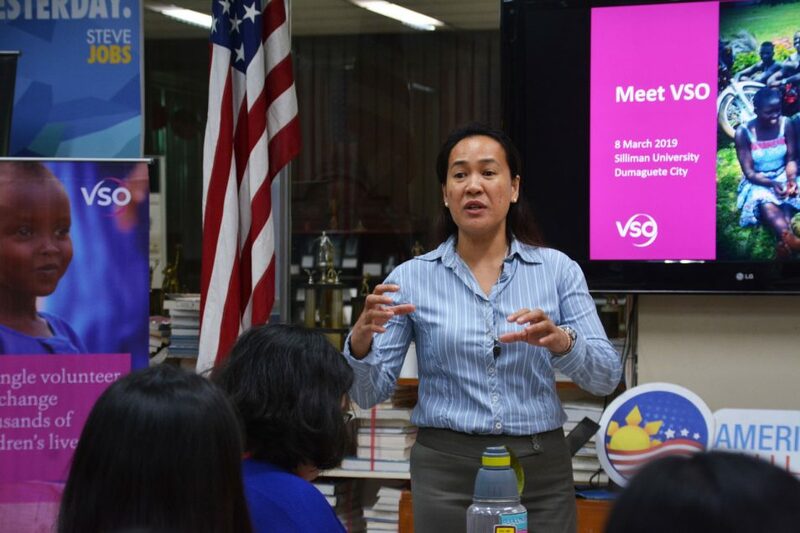 Meanwhile, SU alumna Sharon Rose Dadang-Rafols, who also volunteered for VSO in Uganda in 2013 to 2014, said she was assigned in Uganda’s Ministry of Internal Affairs as a Training and Communications Specialist, working on advocacy and community development. Established in 1958, VSO partners with local and international organizations and private entities in the 25 countries where VSO is working in, focusing on education, health, and livelihood development programs. “We try to incorporate other issues in programs such as gender inequality, social inclusion, and including the marginalized sector especially in education,” said Cu, who added that VSO works in the “poorest of the poor” communities. Students and other members of the SU community attend the VSO orientation. 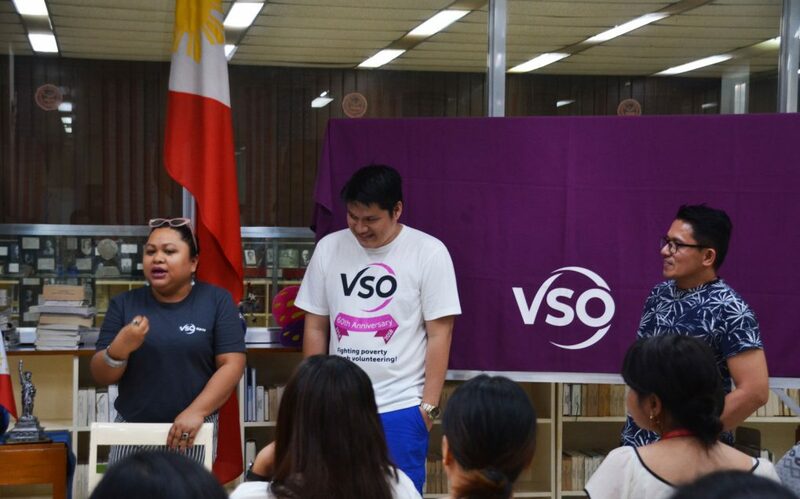 In the Philippines, VSO has established its program on resilience for peace and social cohesion in Mindanao. Frinwie Muma, who had just completed her Master’s Degree in Peace Studies in SU, said she worked as a Safeguarding and Peacebuilding intern in VSO’s office in Davao City. Aside from their office in Davao City, Cu said VSO has another office in Manila for resourcing or recruiting national volunteers who want to work for VSO in the Philippines, and for international volunteers who will be assigned abroad as professionals for 1-2 years. VSO volunteers, especially international professional volunteers, are trained before going to their assigned country. 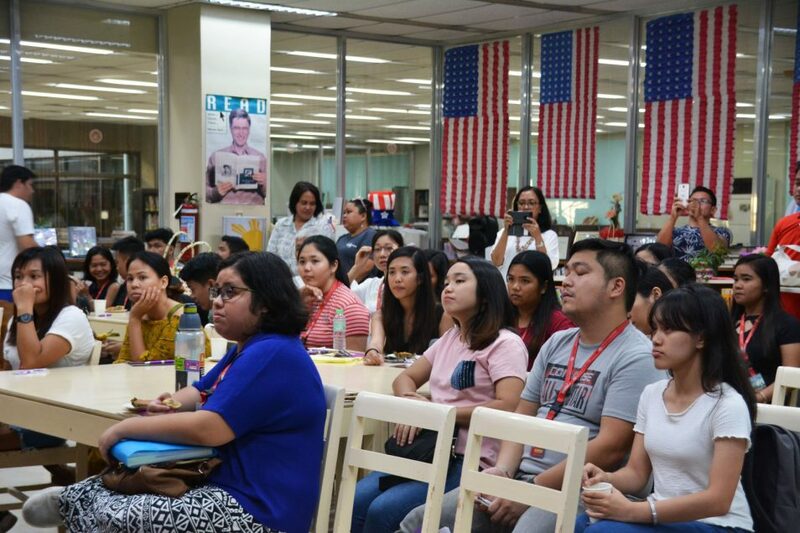 Since 2000, more than 2,000 Filipinos from different professional backgrounds have been deployed as international volunteers in Africa and Asia. “International volunteers range from 25-year-olds to as old as 65-year-olds. The oldest Filipino volunteer is in Cambodia. She is 73 years old; a retired guidance counselor on her fourth VSO assignment,” explained Cu. Individuals who are 18-25 years old, she said, can join VSO as youth volunteers. VSO is funded by grants and donations from agencies, trusts, private companies, and the general public. Its largest funding partner is the Department for International Development of U.K.
Cu said VSO is in need of more professional and youth volunteers in the following fields: education, health, business and management, community and social development, governance, secured livelihood and natural management, advocacy resource mobilization, Information Technology, and technical-vocational training. (L-R) Maloy Quesada Tiongson, People Resourcing manager of VSO in Asia Pacific, and Dr. Earl Jude Paul Cleope, SU vice president for Academic Affairs, sign the memorandum of agreement between SU and VSO. 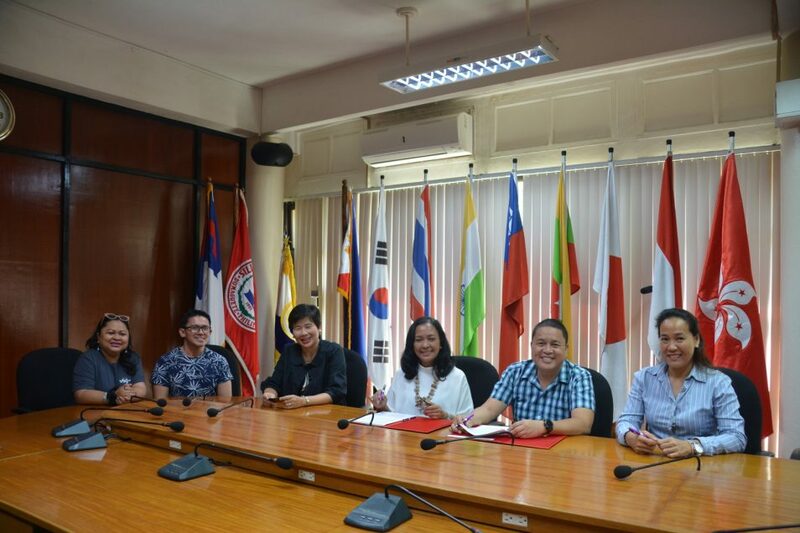 (L-R) SU alumna Sharon Dadang-Rafols and SU Guidance and Testing Division Head Jaruvic Rafols, former VSO volunteers assigned in Africa; Prof. Jane Annette Belarmino, SU vice president for Development; Tiongson; Dr. Cleope; and Catherine Cu, People Resourcing adviser of VSO in Asia & Pacific. 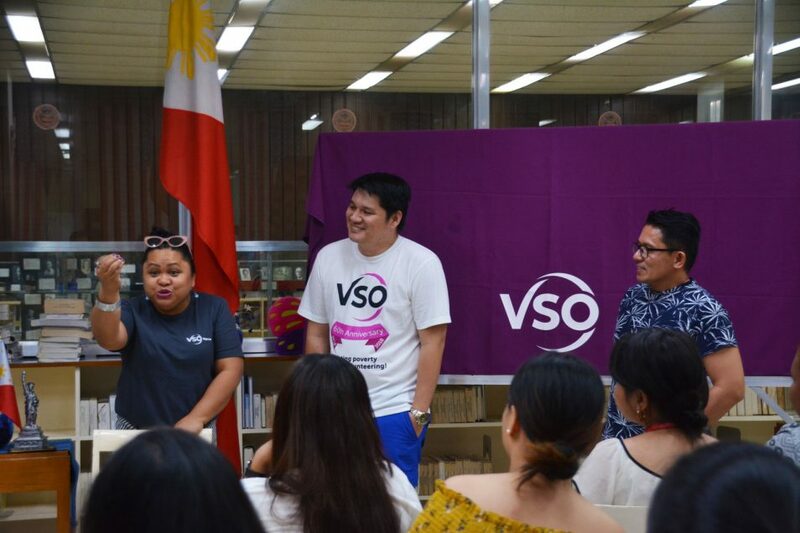 Before the VSO orientation, SU signed a memorandum of agreement with VSO, formalizing its partnership with the volunteer organization.